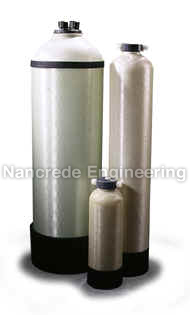 Nancrede Engineering offers service deionization (SDI) with portable deionization tanks throughout Indianapolis and Indiana. We offer a full range of two-bed and mixed-bed industrial DI exchange tanks. With our time-saving service, deionization tanks are provided for startup, and as the deionization tanks are exhausted, new fully regenerated tanks are delivered through our service deionization (SDI) tank exchange. Our deionization exchange tanks are either two-bed or mixed bed units with an acid-regenerated cation connected in series with an alkaline-regenerated anion vessel. The DI cation resin is a strong acid type and is regenerated with hydrochloric acid at our factory. The anion resin is a strong base type II and is regenerated with sodium hydroxide. The exchange tanks are sized based on flow rate and gallons per day usage. The quality of the demineralized (DI) water is normally within a 10-25 micro ohm range when influent water qualities are 15 grains per gallon total exchangeable anions or less. Operating conditions and an actual influent water analysis are required for predicting more exact capacity, leakage level, and service flow duration. Contact us now to start your service deionization.